Dresden, Germany. 14th May 2014. I was now heading towards a part of Germany I had never before visited. Not that I’ve been to Germany often, but I did enjoy a ten day tour there in the early eighties as roadie for my favourite RnR band, The Flying Saucers. At that time Dresden, which used to be in the DDR, was strictly off limits. Not now though, and it was time to see what delights it had to offer. 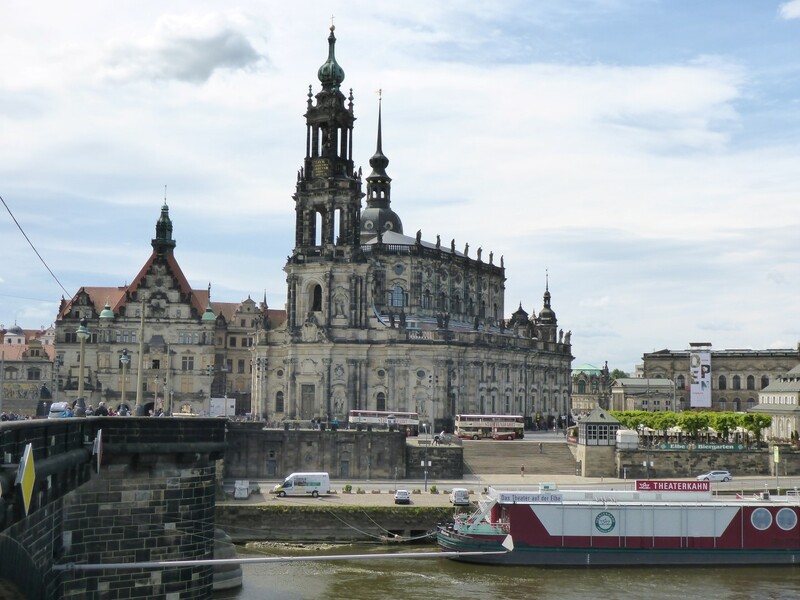 Dresden is the capital of the state of Saxony, so many of us from the UK could feel at home there, depending on much Anglo-Saxon blood we wish to claim. And it’s true to say that I found the city to have a relaxed feel to it, helping me to feel relaxed too. The hospitality at Kangaroo Stop Hostel was certainly good. It has its own yard, which means you don’t have to park on the road, but better than that Liane, the owner, offered me the use of a garage in which to put my bike. Now that really was useful for the peace of mind it gave. 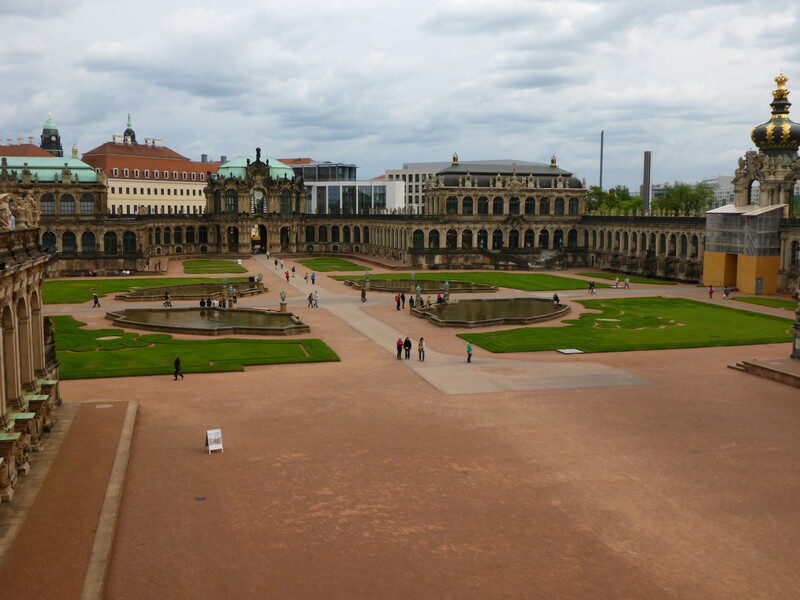 Dresden has two main areas, the Altstadt and the Neustadt, the Old City and the New. The Aldstadt is where all the historic buildings are to be found and was the area worst affected by the Allied bombing of WW2. 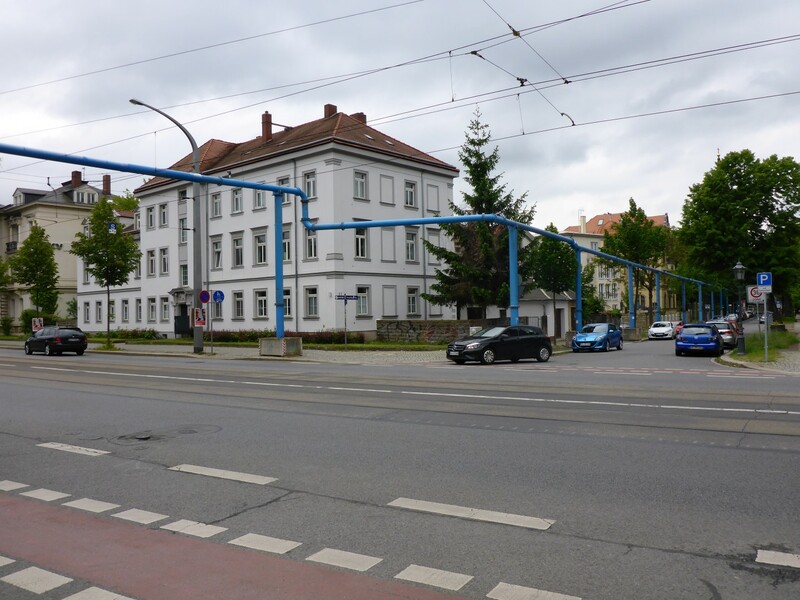 The Neustadt, where kangaroo Stop is located, was nowhere near as bad so is still 19th century original whereas the Aldstadt had to be rebuilt after the war, so isn’t. The nice thing about this, once you get your head around the confusion, is that the Neustadt has a nice easy going, slightly shabby air to it. It has lots of apartments and smaller houses and is full of little bars, bistros and music clubs. Many of the people tend to have a punk/hippie/new age type approach to their appearance. Mixed in with them are what you might regard as ‘ordinary’ people – young mothers with children and so on. The thing is that everyone lives together and the area reminds me of London before gentrification got hold of it. There’s a lot of stylish graffiti which was, I’m told, a way of reacting to the grey old Soviet style of life when the wall came down. Street drinking is legal in Germany and people sit around chatting and whiling away their time, enjoying a beer in the evening. Whatever the reason, this part of the city looks comfortable and accessible. 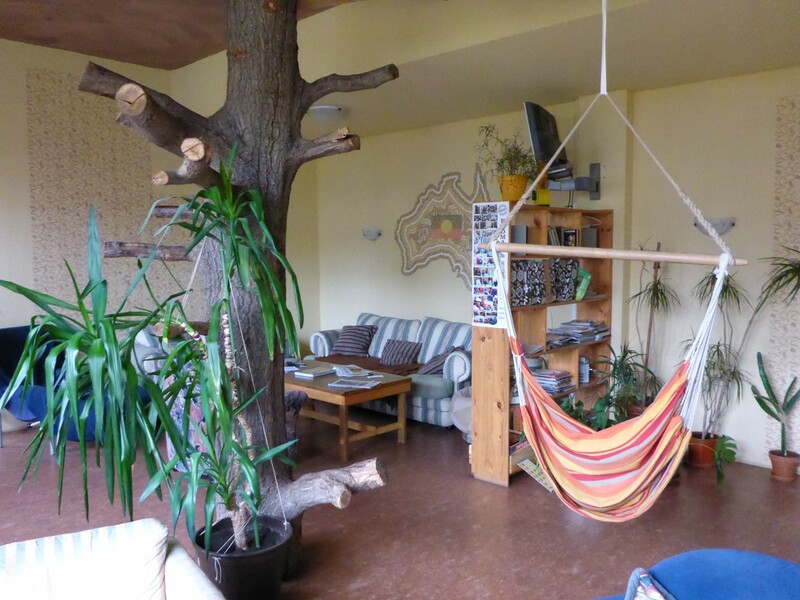 The hostel was very welcoming with a great common room which had a tree trunk sitting in the middle of it. It looked funky and I thought it was a great idea. A very nice kitchen and dining area complemented the lounge. There was a guy already in my dorm when I arrived, a young Dutch guy named Joost. He was from Rotterdam and was on a four week tour of Europe. We hit it off and decided to team up for the evening. Wandering around the streets, we came across a Russian restaurant. Time to get some practice in, I thought, so we went in. I enjoyed a dish that translates as ‘Something From Grandmother’s Oven’, which turned out to be a stew and was really nice. Funky living area at Kangaroo Stop. Blue pies coming out of the ground. Nobody knew what they were for. While we were walking from the hostel I noticed these strange blue pipes coming out of the ground, going along the street for a short distance, then disappearing back down again. I asked the guy on reception what they were for and he said they carry water but didn’t really know why they were there. Speculation suggested the ground was unsuitable for the pipes. Maybe unexploded bombs, was the thought. Joost is well educated and chatty and we enjoyed talking through some of the issues of the day. It’s great to get points of view from a different age group and especially from a different country. He works in the energy supply industry and made some interesting comments regarding how it’s run and some of the issues surrounding alternative energy supply. Back at the hostel we were relaxing and chatting to some of the other people there. At the same time, over in one corner of the room, was a group of four or five Canadian twenty somethings. They were drinking and chatting, putting the world to rights etc. But the thing that struck me was that they didn’t interact with anyone else in the room at all. They were a self contained group. It struck me as a perfect example of the difference between travelling alone and in a group. How you’re far less likely to meet other people and learn about their lives if you don’t have to. Sightseeing beckoned next day so it was off to the Aldstat to see what sort of job they’d made of ‘re-olding’ it after the bombing. 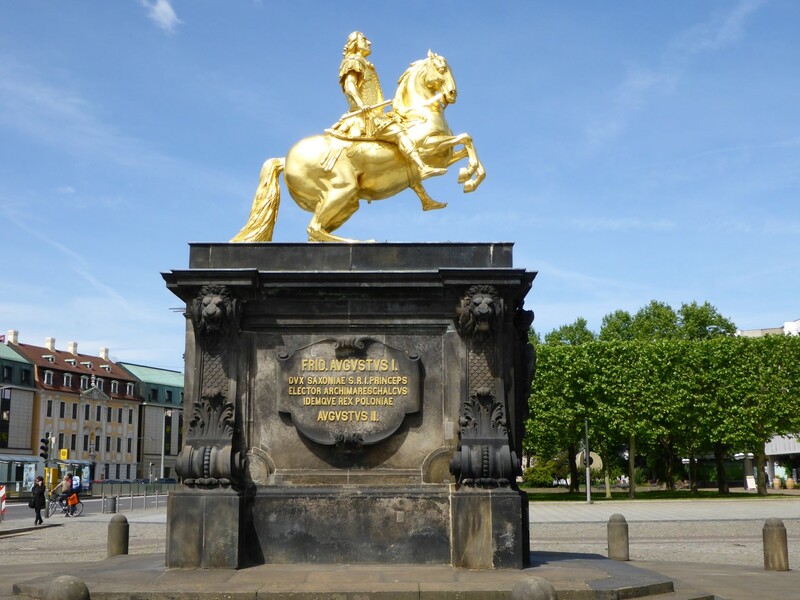 En route to the old city I passed the Golden Reiter (Golden Rider) statue. This is described, by the nicely anarchic tourist map, as an ‘oversized golden statue in Roman garb sitting atop a fat stallion’ Couldn’t have put it better myself. This is a statue of August the Strong, Elector of Saxony. He is facing towards Poland, of which he was also king. The first thing to find out was why the rulers of Saxony were called Electors. I discovered it’s because they were entitled to help elect the Holy Roman Emperor. He was a kind of regional overseer of Northern Italy and most of the German Princedoms. The first one was Charlemagne, crowned by the Pope in 800. As time went by the position became an elected one, usually but not always with the Pope’s approval. The power of the position very often depended on the quality of the alliances the Emperor made and it’s strength waxed and waned over the centuries. The position was eliminated by Napolean when he marched into the area in the early 19th century. I loved the irony of the ruler of Saxony, home of Martin Luther, being involved in appointing a Catholic representative though. Golden rider on a fat stallion, as the locals refer to him. First view of the rebuilt Auldstat as I crossed the bridge. Heading across the bridge I came to the Aldstat. Most of the historic buildings here were severely damaged by bombing and many of them were left by the communist regime as ‘a memorial to the war’. People I spoke to reckon it was simply because there was no money. Those that were rebuilt have mostly had to be done again since reunification, partly because of the poor quality of the work and partly to allow access for people with disabilities. Excellent work has been done and it is still ongoing. My first port of call was the Residenzschloss, home of Kings and Electors from 1458 to 1918. Within are a number of museums. I decided to visit the Treasure Chamber, which contains a collection of artefacts collected by August the Strong and a huge collection of jewellery and other precious pieces also collected by him. The first gallery contained items that he had brought back from his battles with the Ottoman Empire. He was involved in the relief of the Siege of Vienna in 1683 and brought back spoils of war. Most of the collection thouggh were diplomatic gifts brought during the many territorial negotiations between the Ottoman and the Hapsburg Empires. There was quite a fashion at that time, once the Ottomans had been defeated, for Turkish style arms and accoutrements of war and August had an amazing collection of suits of armour, swords, muskets, saddles, tents etc. There was also a display of the history of weaponry from the period. An incredible collection all round. The next gallery focussed on his collection of precious objects. Boy, did this guy know how to spend money! Although, as before, some of them were diplomatic gifts, most were pieces he commissioned from local gold and silver smiths and other makers of decorative models. There were unbelievably detailed and decorated cups, cabinets and ceramics. There was a model of a 16th century ship in full sail, entirely made from ivory; an amazingly detailed model of an Indian Nabob holding court with very decorative figures arranged in the way they would have been in real life, princes, soldiers, courtiers, servants. All carved in exquisite detail in gold, silver and precious stones. 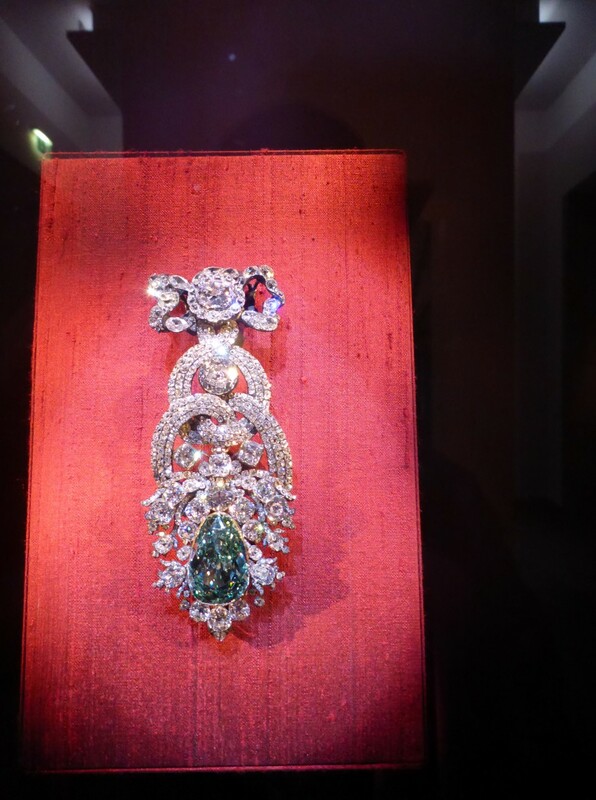 The most amazing piece was a green diamond, about the size of a walnut, in a setting of 141 other diamonds. It gets its green colour from natural radiation and is completely unique. A real jewel among jewels. No photos allowed, but I sneaked this one of the 147 carat diamond. Lots going on in this nice painting. It’s almost impossible to describe how fantastic this collection is, not only in the range and quality of the pieces but also in the number of them – over 1,000. 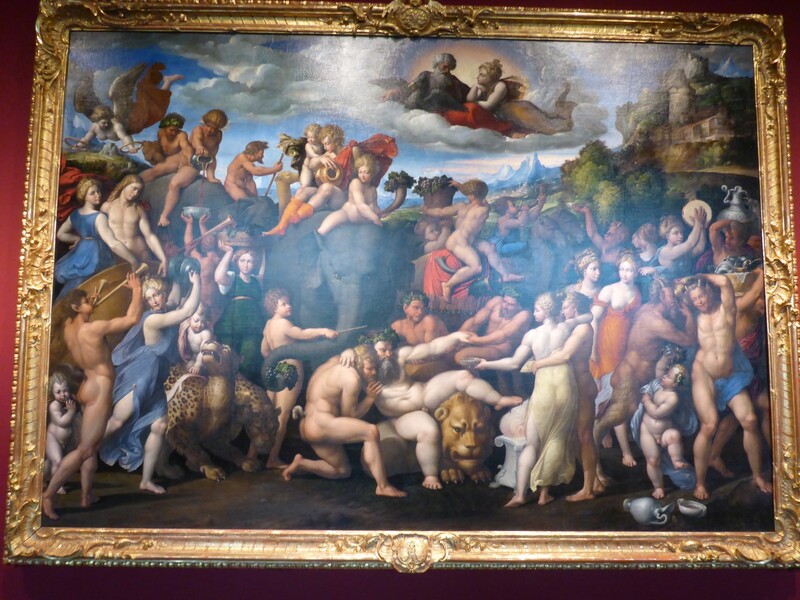 Further galleries contained collections of paintings and sculptures dedicated to, for reasons I didn’t quite understand, Dionysus, god of the grape harvest. All of them very good and interesting. Unfortunately photography wasn’t allowed but I did manage to sneak a couple, at risk of being thrown off the battlements. I staggered out of there about three hours later, desperate for cake and coffee, those essential pick-me-ups. I took a walk along the Bruhloche, the Balcony of Europe. It is alongside the River Elbe and was built on top of the old fortifications two hundred years ago. It passes in front of some of the major museums of the city. 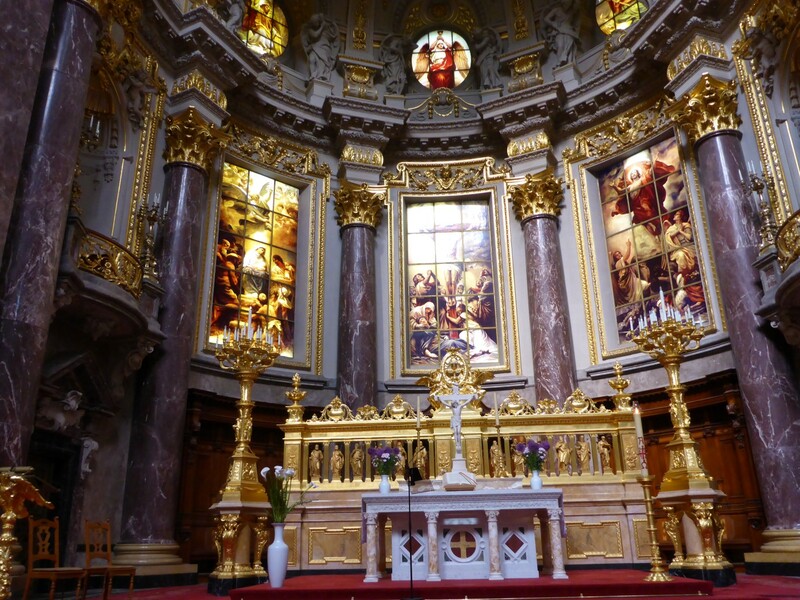 I took a look inside the Frauenkirche, the cities cathedral. Rebuilt and reopened in 2005, it stands as a monument for peace and reconciliation. It has a very modern interior, with seating ranked in tiers against the circular external wall. I went up the tower and got a good look over the city. It’s surprising how much renovation work is still going on along with some archaeological work too. The old city isn’t very large and is surrounded by modern buildings although they don’t overpower it. I think the amount of post war reconstruction has had to be limited. Apart from anything else, the communist regime didn’t take on that task to the extent that the western cities did. I started to head back but took a swing past the Zwinger. This is the name given to the outer ward of a concentric castle and is in the courtyard of another large museum complex. Good old August had it built in 1709 and it’s a significant example of Baroque architecture. It’s got lovely lawns and manicured gardens and used to be used as a fairground. 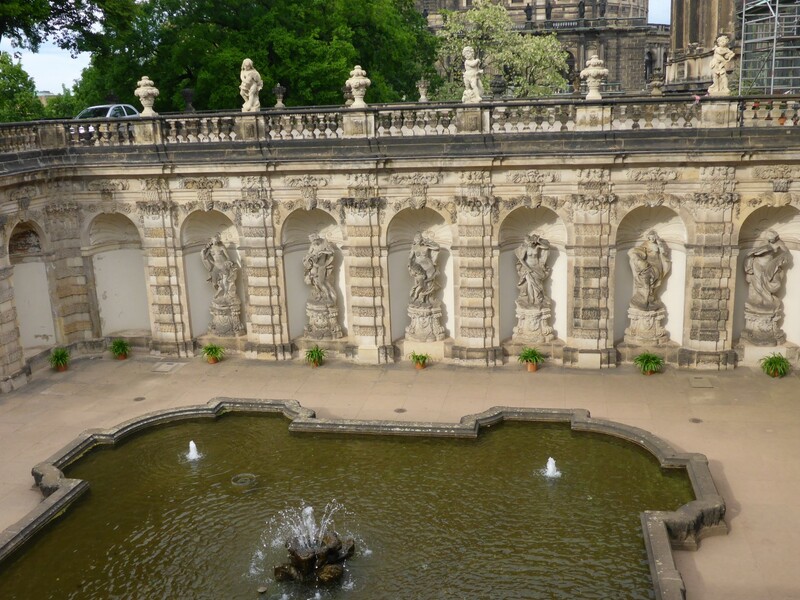 I was able to walk up onto the terracing and admire the fountains and the collection of decorative statues. I was too late to visit any of the museums, unfortunately. The gardens of the Zwinger. Back at the hostel I got chatting to a young American woman, Kelsey, who had just arrived. She’s studying mechanical engineering and had just finished a semester in Madrid. She speaks Spanish and is also doing a course in photography. Clever girl. The same cannot be said of her Mother, unfortunately. Kelsey had wanted to visit Prague but her Mother vetoed the idea as it’s too close to Ukraine. Yes, really! How amazing. Joost came back in with Patrick, another guy we’d met there and I decided to raid the leftovers shelf in the fridge. Every hostel will have a ‘free shelf’ where people can leave food they don’t want to take with them when they go. I found some pasta and various other bits and pieces, enough to knock up a decent meal for all those present. It was appreciated by all. Later Patrick, Joost and I went to a bar we’d been told about to sample the night life. One of the girls on reception told us of a place where a rock n roll band was due to play, ‘Definitely 50’s RnR’ she assured us. Hmmm. A kind of thrash metal with 50’s guitar riffs was the best they could do but some of the songs were quite amusing and they made a good sound for a three piece. I left them to it after a while and headed back for some sleep. I enjoyed Dresden very much. It has much to offer the cultured traveller, with its ‘old’ buildings and the plentiful museums of different varieties. But I think its biggest strength lies in its attitude to its post communist freedom. It’s grabbed it by the scruff of the neck and taken a youthful, joyous, devil may care approach to sorting out the mess left behind. There’s definitely something for everyone here whatever your touristic needs might be. I really enjoyed it there. One final piece of brilliance occurred the morning I left. Liane, the owner of the hostel chatted to me about how she came to start up the hostel and how its name came about. She used to be a civil engineer but got sick of the business side of her work, with its macho posturing, always chasing the latest toy. So, having travelled herself in the past, she decided to open a hostel herself. It was hard going, working all the tough hours and struggling financially but she made it in the end. And the name? Because of its large, flat tail, a kangaroo can’t go backwards and that was the attitude she took towards her project. What a great story. And she gave me a little kangaroo with a baby in its pouch as a good luck mascot. 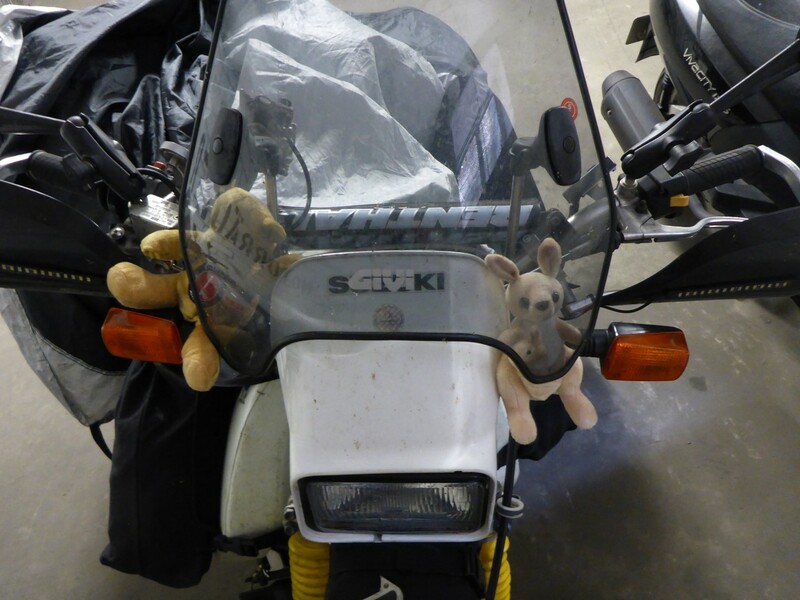 Named Mrs Skippy, she now sits proudly on the front of my bike along with Chris, my CAFC mascot teddy. Thanks Liane, I hope you continue to do well. Mrs Skippy, next to Chris, my CAFC mascot. Berlin was my next destination but on the way there lies a small town called Colditz, which hadn’t escaped my attention. The most famous people connected with this place are the ones who did their best not to stay there very long. 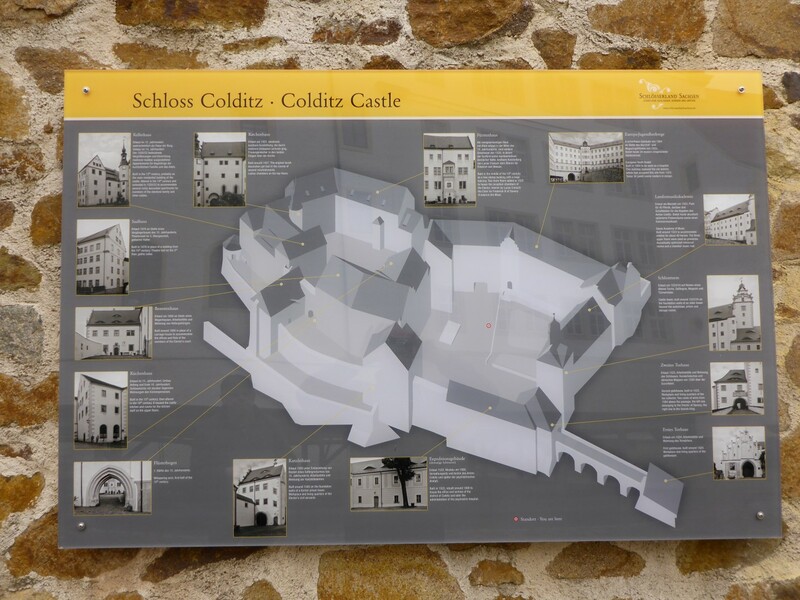 Colditz Castle was a used as a prisoner of war camp for ‘incorrigable’ escapees, mostly officers. The history of the castle is straight forward enough, having been built in the 16th century and used as a hunting lodge then an administration centre. It became a POW camp in 1939, reckoned to be escape proof because of its layout and location, up on a hill. In fact it had one of the highest number of successful escapes. Despite British TV’s obsession with it, the greatest number of successful escapees were French, with twelve, against eleven British. French prisoners were moved elsewhere in 1943. But the greater story lies in the attempts. The British made 117 attempts in total, some disguising themselves as soldiers, workers or even a woman in one case. They managed to secrete a radio up in the rafters which they used to listen to coded broadcasts. 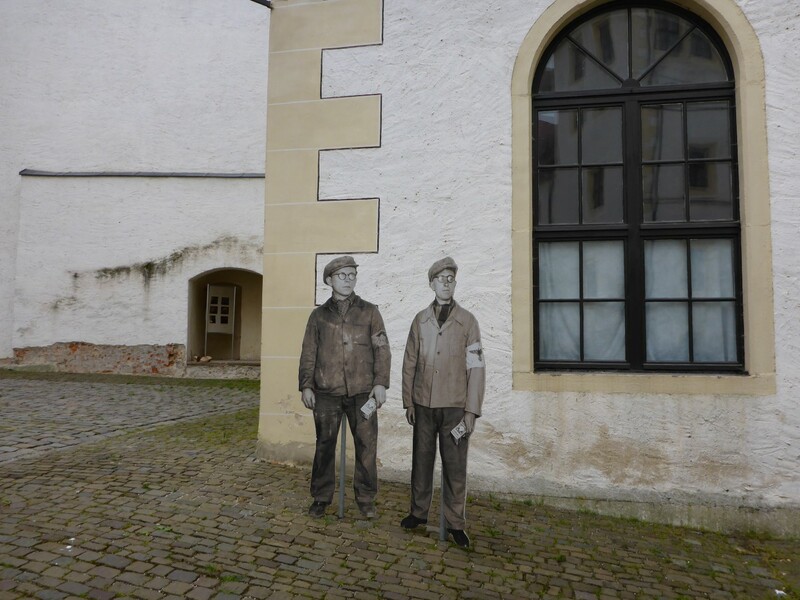 They were able to make replica uniforms, ID cards and all the things needed to get them from Colditz to Switzerland, which was the most common escape destination. From there it was through Vichy France and Spain. The most amazing escape plan involved the construction of a glider. The plan was to fly it off the roof of the castle, over the defences and into a field near the river. It was never put into effect as the castle was liberated by the Americans before the chance came. Sadly, the glider was destroyed and only one photo of it remains to confirm its existence. Many years later the officer who designed it was able to redraw the plans and a scaled down version was made and flown successfully. Would the original have worked? We’ll never know but it’s an amazing example of the ingenuity of these prisoners. The museum was full of letters, photos and examples of the false documents the prisoners made. We were guided round by a German guy with an amusing English accent, who new his stuff and told us all the stories. The most famous escapee was Airey Neave, who was sadly killed in the IRA Brighton bombing. After the war the castle ended up in the Russian zone. 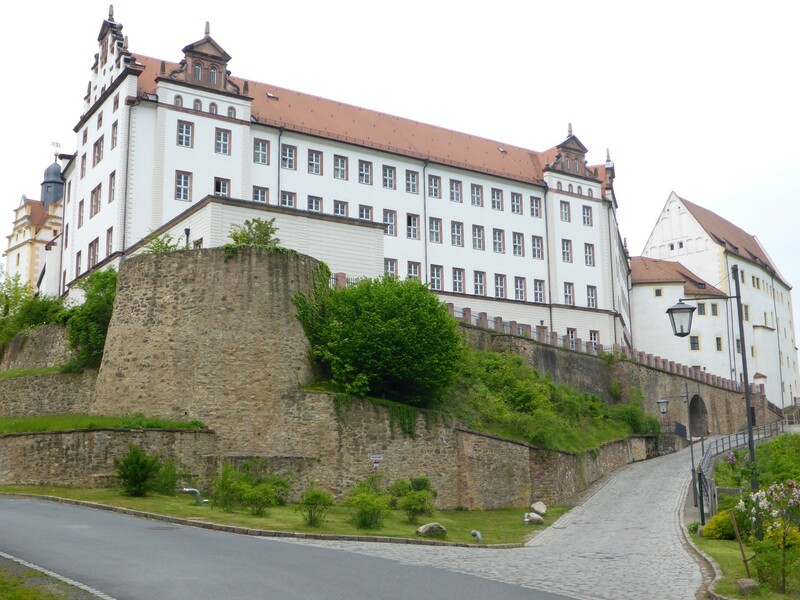 Colditz Castle, up on the hill. The layout of the castle. Entrance to one of the escape tunnels. One of the prisoners pretending to be a German worker. German motorways are smooth and easy so Berlin came up quite quickly after leaving Colditz. I was booked into a hostel called Inn Berlin and the owner had left the key out for me in a secure box as he wasn’t able to be there when I arrived. This hostel was a converted office complex and Ralph is another person who’s left the rat race to, not follow his dream exactly, but to do something different. I’ve been to Berlin before, in 1983 when it was still a divided city. The one thing I remember about it was the atmosphere. There was a real buzz about the place, with people seemingly living life at ninety miles an hour. I wondered how it would feel second time around. Inn Berlin has comfortable beds and good facilities. Ralph rides a Harley Davidson when he has time and he dealt with my concerns about parking the bike by inviting me to put it in the underground garage of the office block. Warm, dry and secure, I couldn’t ask for more. Thanks Ralph! Berlin is a big city and doesn’t have a city centre as such. Rather, it has various areas that reflect different aspects of it. I was planning to spend several days there so was happy to take my time about looking around. Ralph had given me a tourist map of the city and had shown me where all the main areas to visit were. His hostel is within ten minutes or less of the S-Bhan, the U-Bhan and the trams. Buses ran right outside. 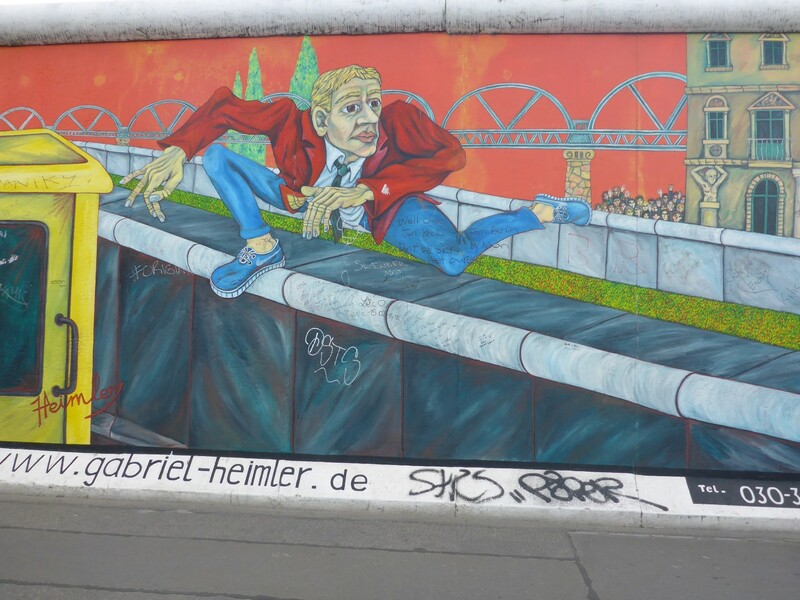 The great thing with Berlin is the transport system, which is extensive and varied. You can buy a ticket that covers you for a journey or a weeks worth of them and one ticket covers all modes. You can pay a bit extra and get one that includes discounts on museum entry fees too. Very tourist orientated. I bought a seven day ticket for just under EU30 and made good use of it. One thing I had to satisfy my curiosity about was what the ‘S’ in S-Bhan stands for. Nothing at all it seems. The U-Bhan was there first, the U standing for Untergrundbahn, the German word for underground. The S was adopted simply to match the U, that’s all. Very prosaic. 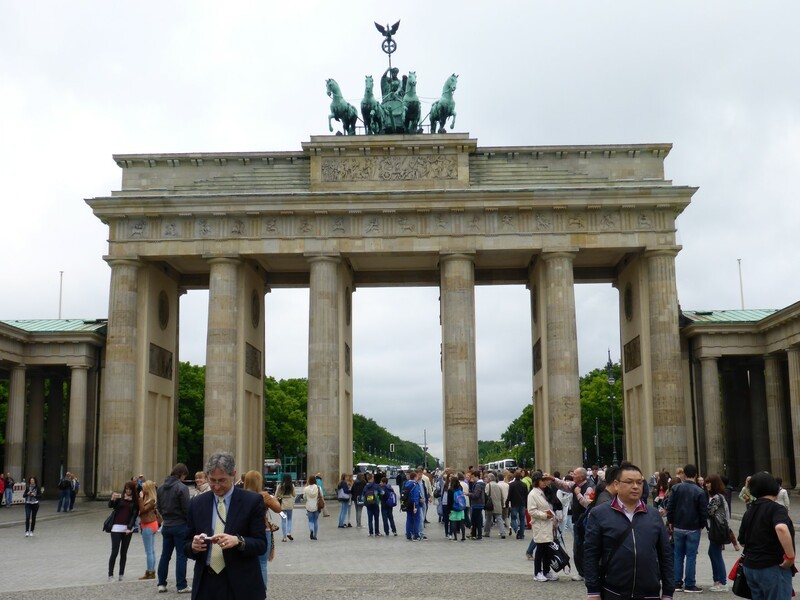 Continuing my theme of digging into a city’s past, my first visit was to the Brandenburg Gate. Trapped behind the Berlin Wall until 1989, it had been cleaned up and restored to its former 18th century glory. 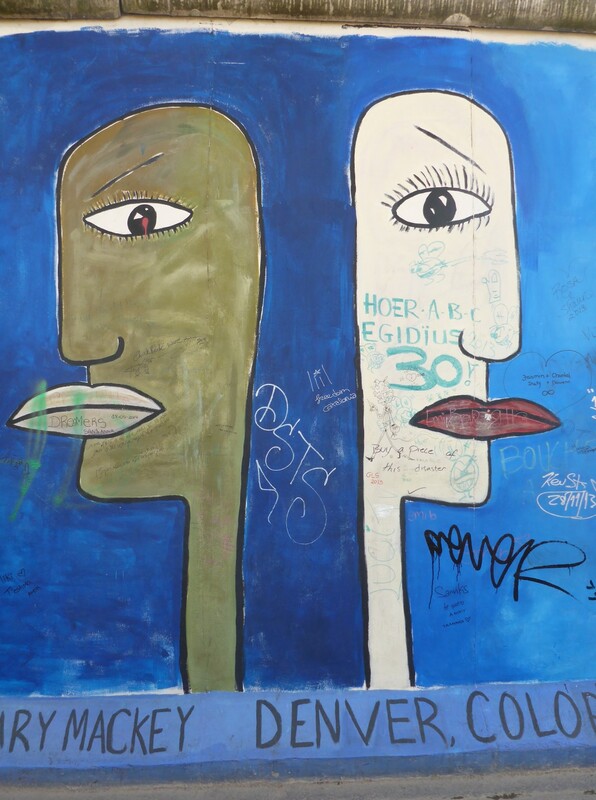 The gate was originally one of several in Berlin’s ‘Custom Wall and a rebuild was commissioned by Friedrich Willhelm II to represent peace. It was undertaken between 1788 and 1791, replacing the earlier simple guard houses each side of the original gate in the Customs Wall. The Gate consists of twelve Doric columns, six to each side, forming five passageways. Citizens originally were allowed to use only the outermost two on each side, with the others reserved for royalty. On top of the gate is the Quadriga, a chariot drawn by four horses driven by Victoria, the Roman goddess of victory. However, the new gate was originally named the Peace Gate and the goddess could then also be interpreted as Eirene, the goddess of peace. The gate’s design is based on the gateway to the Acropolis in Athens and is consistent with Berlin’s history of architectural classicism. The Gate was the first “Athens on the River Spree” by architect Carl Gotthard von Langhans. The capital Quadriga was sculpted by Johann Gottfried Schadow. That’s a precis of what Wikipedia says about it. All I know is that it’s tall, wide and looks great now it’s been cleaned and repaired, especially compared to how it looked when I used to see it on TV stuck behind the Berlin Wall. It’s a fitting centre piece for the reinstated capital city. The Paritzer Platz, in which the gate sits, has also been refurbished and is a fitting site for this monument. The very impressive Brandenberger Tor. As capital of Prussia, Berlin was renowned for its willingness to adopt enlightenment attitudes during the 17th and 18th centuries. 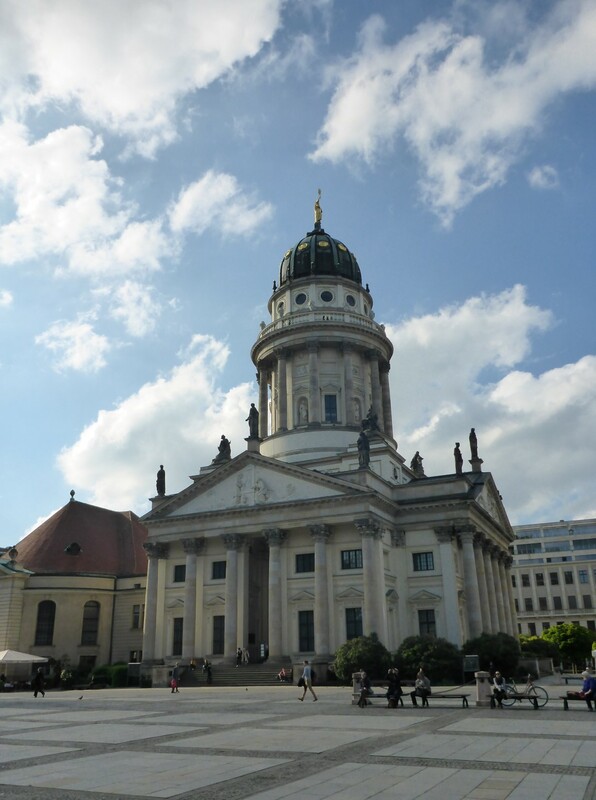 In the Gendarmenmarkt sit two very large churches, almost identical in design and facing each other across the square. They exist because the French protestant Huguenots, under threat of persecution in the 17th century, were invited to Berlin by The Great Elector Freidrich III and assisted by him in building a church. The Huguenots tended to be skilled artisans and craftsmen so were able to enhance trade in the city. 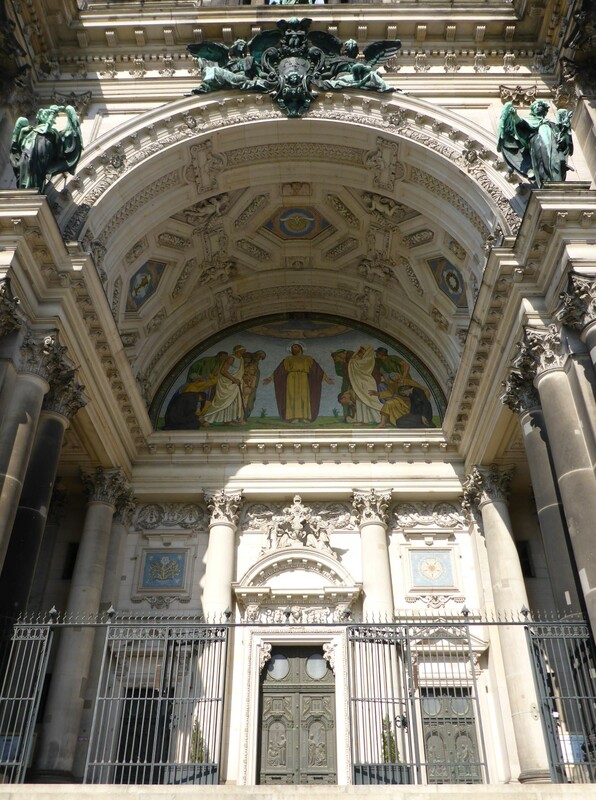 Of course, to be fair to his Prussian subjects, Freidrich had to cover the cost of building a new church for them too, so the two buildings, known as the French and German Cathedrals now face each other across the square. It’s rumoured that the German one is a metre taller than the French one, just to maintain the correct relationship. Not far away in the Bebelplatz is the Humboldt University. As well as being a fine building, it was the first university in Europe to combine learning with research amongst its scholars and scientists. It opened in 1810 and has since produced 29 Nobel Prize winners. 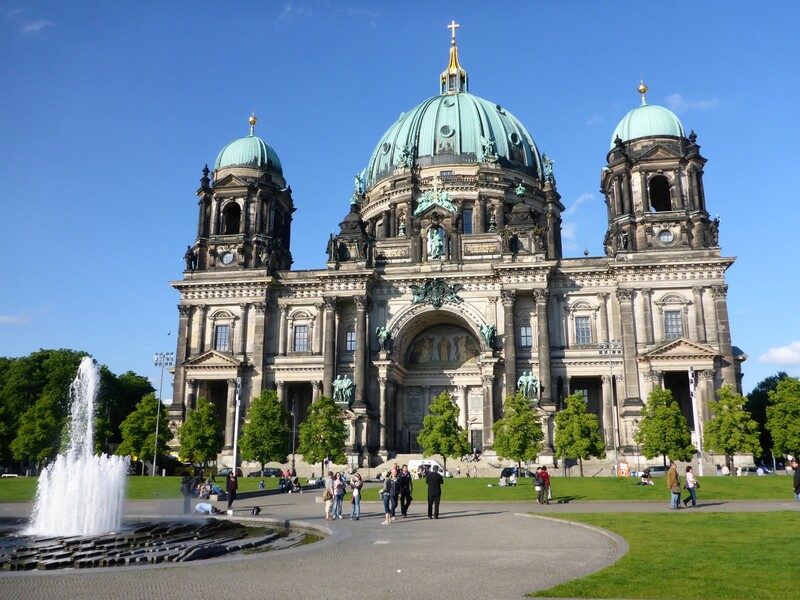 In the River Spree there is an Island, the northern half of which is known as Museum Island. Surprisingly, it’s got several museums on it. Well I never! There are five all told, with build dates from 1830 to 1930. The most famous is probably The Pergamon, with a huge collection of classical and archaeological items. I won’t go into further details as I didn’t visit any of them, but anyone who has the time to visit will easily be able to find out what’s where. 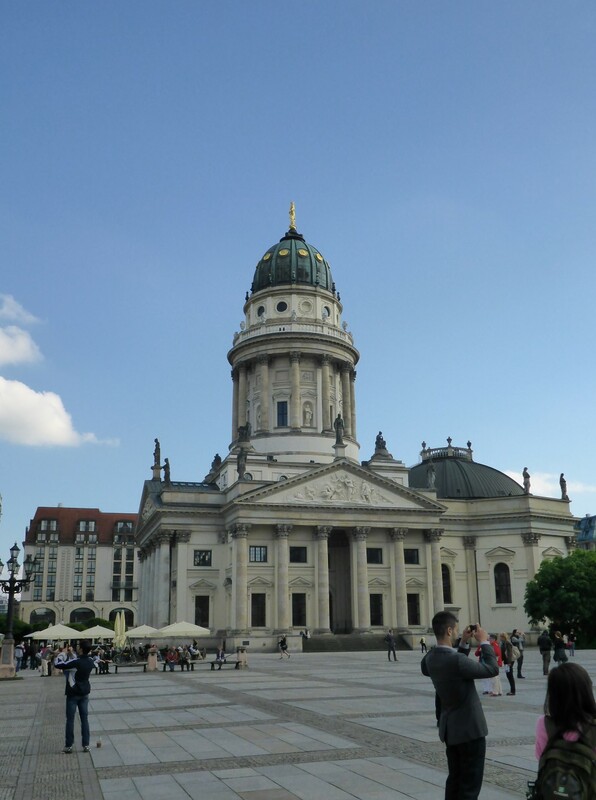 The one place I did visit on Museum Island was the Berliner Dom, the Berlin Cathedral. This building replaced earlier ones on the site and had been in the planning stage throughout most of the 19th century, from the time Napoleon left Berlin in 1814. Lack of money meant lack of any progress and it wasn’t until the late 19th century, several architects and their rejected designs and the reign of Kaiser Willhelm II that things got going. It was finally completed in 1905. It was said that the Kaiser fancied himself as having some architectural skill and influenced some of the design. Whether or not this is true this building is gobsmackingly fancy, both inside and out. It ‘enjoys’ a high neo-renaissance style but with baroque and classical elements as well. All of that would mean something if you were standing there looking at it. I can only offer you photos. Entrance into an amazing interior. The interior is beautiful and has a fantastic altarpiece, the altar itself and the ceiling paintings are all wonderful too. 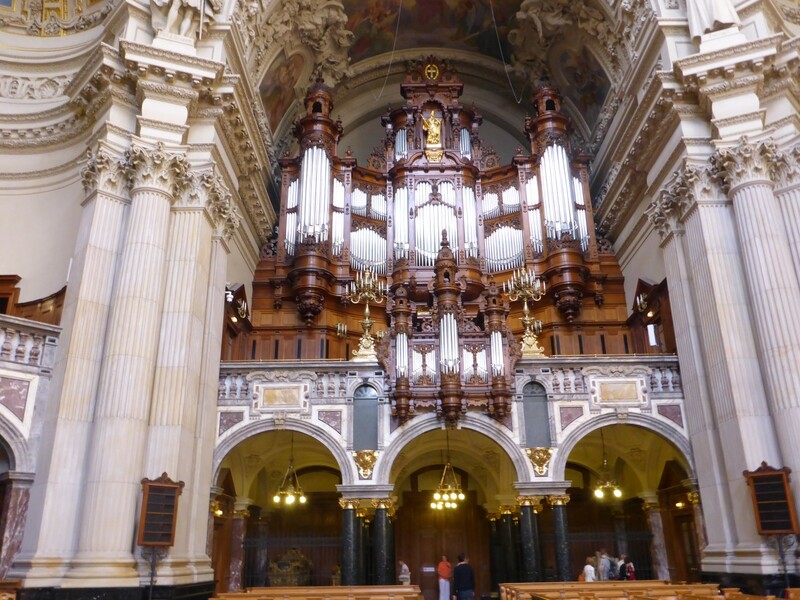 The organ is amazing, with 7269 pipes and is regarded worldwide as the most important intact instrument with pneumatic action from the Romantic period. All in all it’s an amazing building and I particularly like the fact that as well as the usual religious figures, on top of four of the interior columns stand statues of enlightenment and reformist luminaries – Calvin, Zwingli, Luther and Melanchthan. I went for a walk up to the balcony on the exterior of the dome for some great views over Berlin. Maybe one of the most heartening aspects of this building was its post war reconstruction. The dome was badly damaged by bombing and the East Germans put on a temporary roof. In 1975 a proper reconstruction was started but this was a joint effort between East and West Berlin, with money and craftsmen from both sides of the city, in truth more money from West than east. A cynic would say that the encouragement for the East German authorities was the flow of much needed Marks from the West but even so, it was a major step in the thawing and normalising of relations between the two halves of a divided country and city. My next cultural visit was to the German History Museum. I didn’t get there as early as I would have liked so left myself slightly short of time to see everything. In fact the staff were ushering me out of the door by 17.50 so they could clock off on time at 18.00. Regardless, I saw all I needed to understand the complexities of the German progression from their start in about 100BC to 1994, just after reunification. Do you want to know? OK, here’s the brief run down. While there were various tribes in the area from pre-Roman times, it is really only late in the first millennium that the region started to gain its modern shape . Charlemagne was appointed the first Holy Roman Emperor in 800 and this empire shaped not only Germany but many of the countries around it too. Local rulers were entitled to elect the holder of this position and as Medieval times progressed the independent states started to work more closely in common cause. The Hanseatic League was founded in the 12th century and brought together Guilds and other merchants. Their purpose was to protect trade routes and, more importantly, the trade ports of the North and Baltic Seas. They would negotiate special agreements with monarchs and city state leaders for favourable terms, such as removal of tolls or duties. The league quickly took control of the Baltic Sea, eliminating the threat of Scandinavian pirates and enabled its members, and those with whom they traded, to prosper. The cities of Lubeck and Hamburg, both on the north coast, started it off and eventually even towns and cities in England had joined it. So Germany slowly changed from a collection of medieval independent states into a more coherent whole, although still with regional rulers, Princes and Electors. Often these rulers would have control over parts of other countries, such as Czechia and Poland. And then Martin Luther popped up. The Protestant movement set in train events which led to religious wars in various parts of the region over the next one hundred years or more. Wars sap the strength of cities and regions, give rise to new power groupings and slow down or stop trade. The new protestant Swedish empire grew in strength and sounded the death knell for the Hanseatic League by gaining control of the Baltic Sea. German Princes fought on different sides of the religious divide at various times. It took the eventual invasion by Napoleon, and his defeat, to kick start the process which eventually led to a confederation of German states. Lack of democracy and social unrest led to revolution and finally, in 1871, the German Empire was formed as a Constitutional Monarchy. And the rest, as somebody famous once said, is history. So now you’re up to date with the historical news, what comes next? 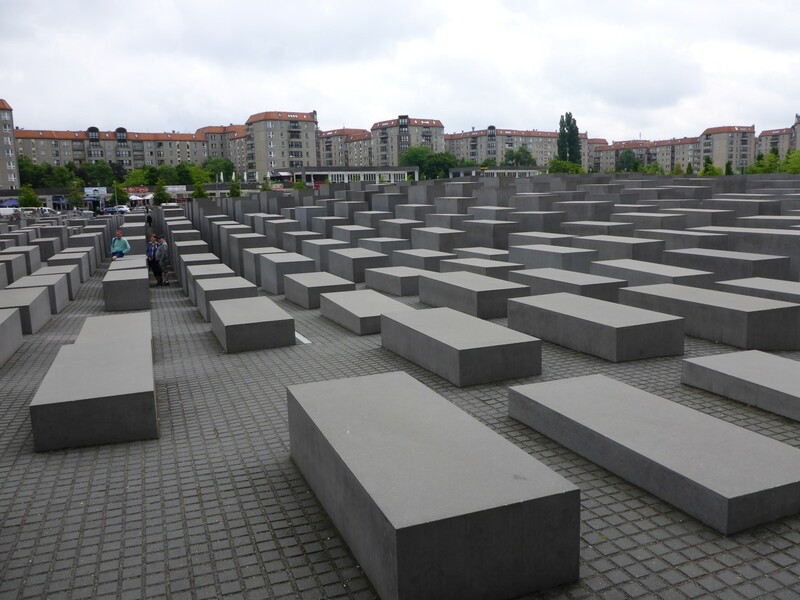 Street level view of the Holocaust Memorial. How it looks from down below. 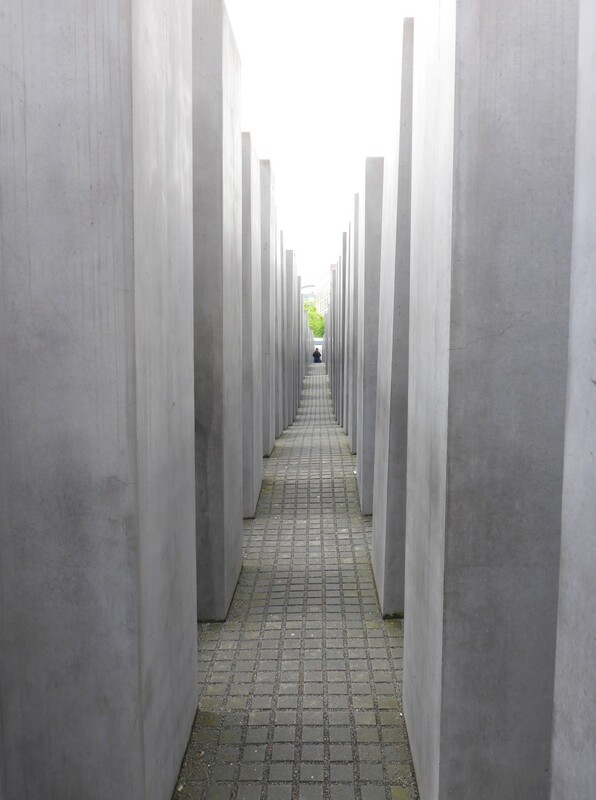 I moved forward to more recent times and go to see the Holocaust Memorial. It consists of 2711 rectangular concrete blocks, all the same shape and smoothly polished, laid out in rows with criss cross walkways in between them. What I didn’t realise at first is that the walkways slowly drop down meaning that I slowly dipped below the level of the top of the blocks as I walked in among them. By going in a straight line I came back out again at the other end although by constantly turning left and right I could have stayed among them as long as I wanted. The sculptor has deliberately made no comment as to what the blocks represent. He wants the individual to interpret them as they see fit. For me, as I walked down among them I saw the light from the sky narrowing and a feeling of oppression grew, as if entering into a place from which I might never escape. Hope started to fade, just as it would if I was being forcibly taken away from the places and people I loved. Impressive! The only other WW2 related place I visited was when I walked past the former Luftwaffe Headquarters. This building was erected by the Nazis in the 1930’s and followed their love for the Neo-Classic style. The problem was that it lacked any of the decorative flourishes of that style so was really just Neo-Brutal. 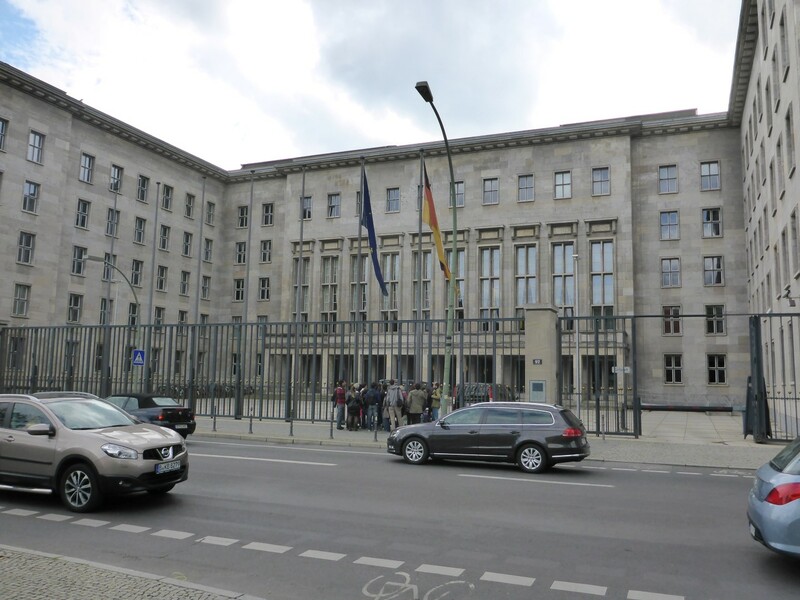 It’s now the headquarters of the German Inland Revenue – how apt. Former Lufftwaffe HQ, now the tax office. Dropping a different kind of bombshell. 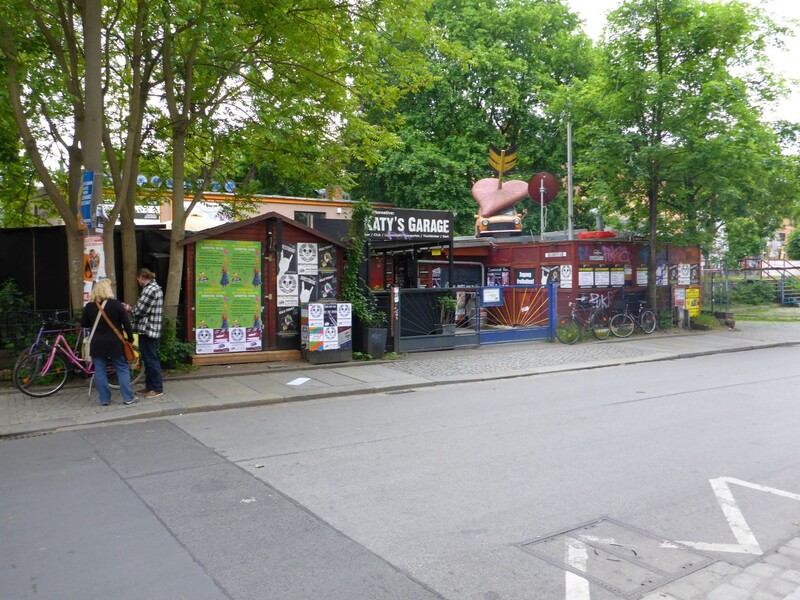 As a city, Berlin has two stories to tell. The first is that of the pre-20th century city, capital of the Prussian Empire then of Germany; city of enlightenment and culture. The second is the one many of us are more familiar with, that of its 45 years as the front line in the cold war. At the Potsdam Agreement of 1944, Stalin, Churchill and Roosevelt decided how Germany would be managed post war and which country would control which area. Berlin lay within the Russian area of control but it was decided that the city would also be divided into four zones, the fourth being run by France. When the city fell and the war ended, this agreement was put into effect with co-operation seeming to work reasonably well. People could move around fairly freely from one zone to another. But the Allied agreements gradually broke down with the Soviets beginning to impose collectivism in their region and the British, Americans and French effectively doing the opposite by combining their zones into one and introducing local administration. Berliners’ freedom of movement was curtailed and the situation deteriorated further when, in response to the introduction of the Deutsch Mark in the allied areas of Germany, and West Berlin’s demands to be allowed to use it, the Russians closed all access routes from West Germany into Berlin. Thus the Berlin Blockade began on 14th June 1948. The Allied areas of Berlin already relied on the Russians for much of it’s food, water and energy, so the blockade was potentially devastating and the Russian authorities fully expected the Allies to cave in. They were confident the end result would be a communist Germany. But they’d reckoned without the ‘Candy Bombers’. This was the name given to the deliverers of food and supplies to the stranded West Berlin during the Berlin Airlift. By the time the blockade was lifted in May 1949 the airlift was delivering more supplies to Berlin than had previously arrived by rail and road. The combined efforts of the US Airforce, along with the RAF, Sth African, Australian, Canadian and New Zealand Airforces, delivered up to 9,000 tons of supplies daily during over 200,000 flights. Russia gave in. Why Candy Bombers? As well as delivering supplies, some of the pilots started to drop packets of sweets, attached to handkerchief sized parachutes, to the children watching the planes’ arrival from the end of the runway. American children, and then manufacturers, started contributing sweets to the operation and it became a major propaganda success. No comments from German dentists have been recorded. The success of the airlift directly led to the formation of two Germany’s, the communist GDR (German Democratic Republic) and the Federal Republic of Germany. Berlin was now a divided city. It demonstrated to any doubters that the West was serious about supporting a democratic Germany and accelerated the formation of a German government. I think it’s true to say that the Soviets learned a lesson about the laws of unintended consequences. As the differences between communist East Germany and democratic West Germany grew many East Germans migrated to the west via Berlin. East Berlin found itself losing thousands of residents to the west. In fact this was happening all over the GDR and the authorities were very concerned at the loss of labour. 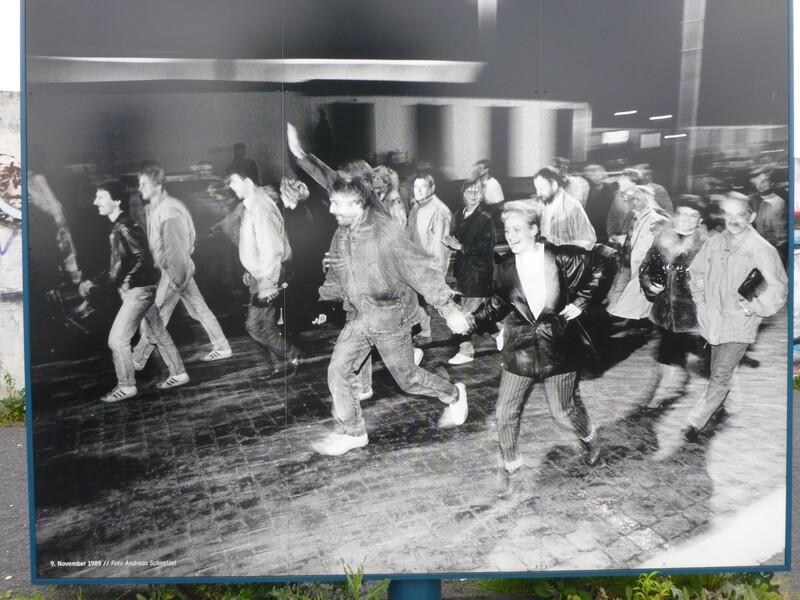 Approximately 3.5 million people took the decision to leave, 20% of the East German population. Many of these were well educated so East Germany was suffering a real brain drain. The GDR’s solution? Build a wall. On the night of 13th August the barbed wire was rolled out across and around the city and the 28 year division of Berlin had begun. In less than a week the barbed wire was replaced by a solid wall. 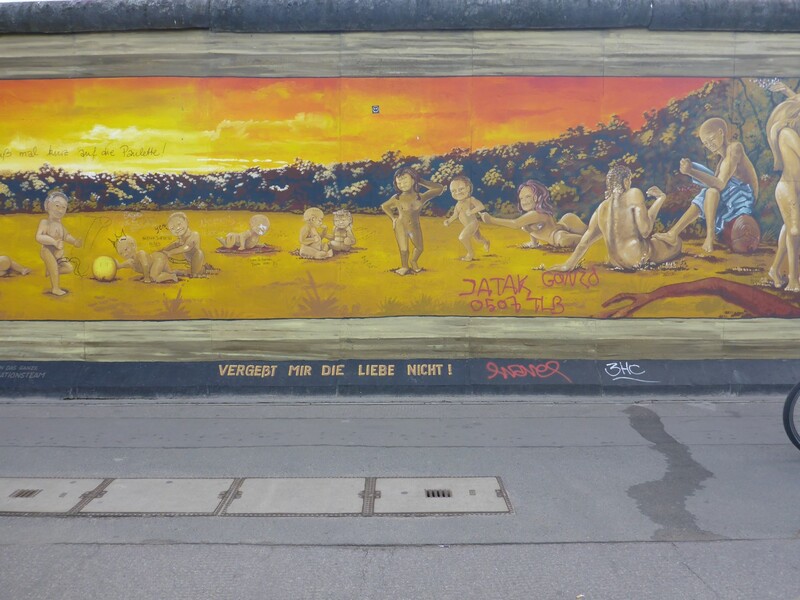 It lay just inside the East Berlin border and did not encroach into West Berlin anywhere. Streets next to the wall were cleared and made inaccessible. It’s necessary to realise that the wall didn’t just divide the city, it completely surrounded it, a distance of around 160km. 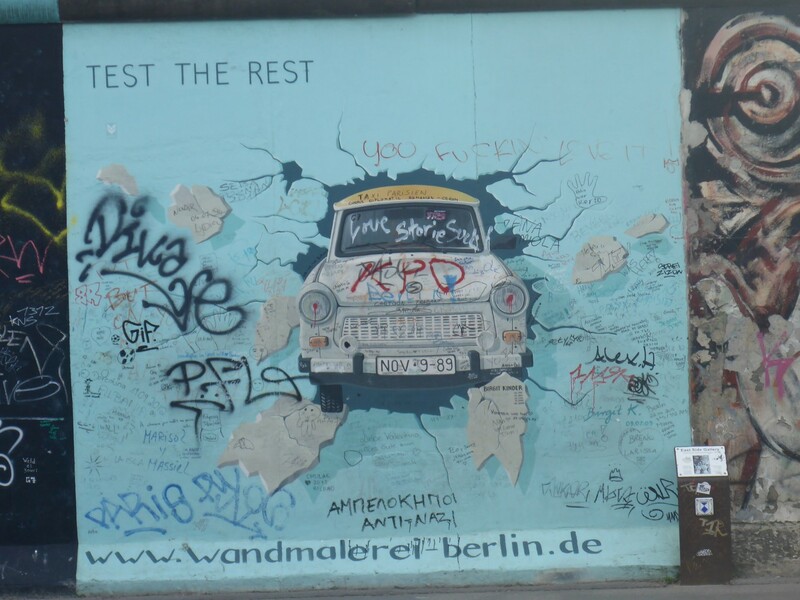 West Berlin was now an island of freedom in a sea of repression. Families and friends were divided by this unnatural barrier and the world outside watched and waited to see how things would develop at this new concrete frontier of the cold war stand off. 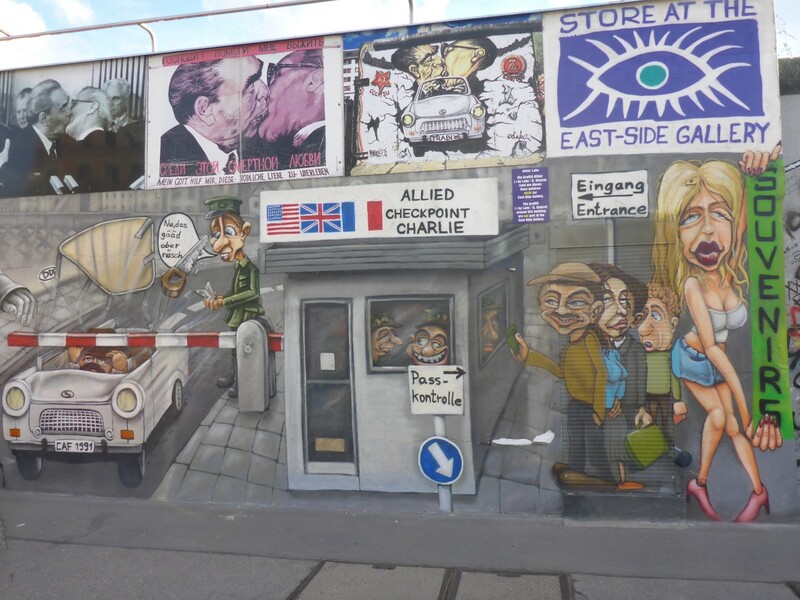 The rather naff mock-up of Checkpoint Charlie. The excellent historical display on a section of wall. 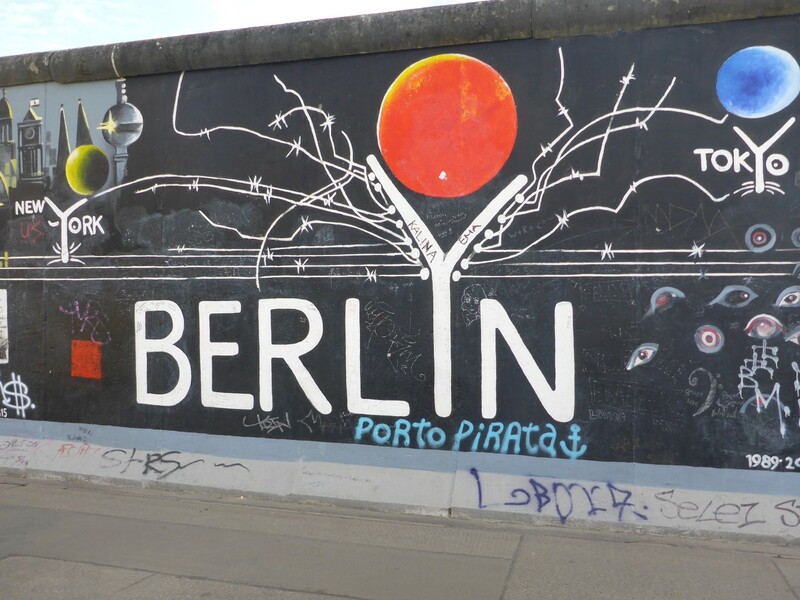 For visitors to the city there is plenty still to see despite the wall having been almost entirely removed since that wonderful day in November 1989 when East Germans were unexpectedly given permission to cross to West Berlin without restriction. On their way across they decided to take the wall with them (figuratively) and it wasn’t long before most of it had been demolished. But the city authorities soon realised the historical significance of what was left and preserved some sections. I visited some of the best known sites and was able to get a deeper understanding of events. Although I was only ten when the wall went up there were plenty of notable events that occurred over the years which I remember seeing in the news as I grew up. The various sites I visited brought many of them back to me. Here’s an overview of what I saw. 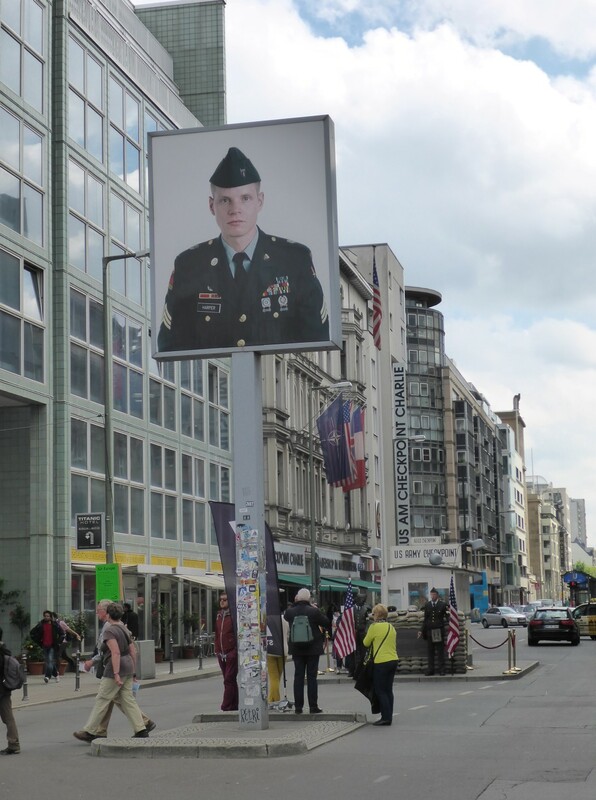 Checkpoint Charlie. This crossing point became infamous as the place where spies were exchanged between East and West on dark drizzly nights, especially in John Le Carre novels. A nicely alliterative name surely chosen for just such a purpose? Its reality is a bit more mundane. There were three crosiing points in the wall, A,B and C. Alpha, Bravo and Charlie. Charlie was the one used by diplomats and approved forces representatives. After the wall was built A and B didn’t get used very much because of the restrictions on travel placed by East Germany but C carried on as normal. But in October 1961 it earned a greater notoriety than anything any novelist could give it. East Berlin border guards decided to stop approved military vehicles from the West and to check the occupants’ ID. This was against standing agreements and it upset the Americans greatly. The US General in charge ordered that tanks be brought up to the checkpoint to underline their right to cross. The Soviets did the same. Stand off! All tanks had live ammunition and all had orders to fire if fired upon. 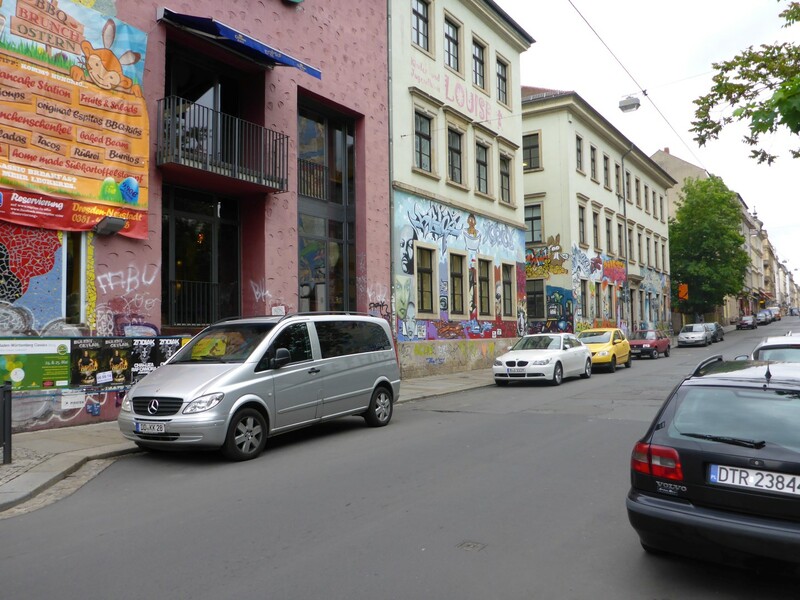 World war three may have been about to start in an urban street in Berlin rather than a sunny Caribean island! It took phone calls between Presidents Kennedy and Kruschev to reach an agreement which was that the Americans would withdraw their tanks when the Soviets withdrew theirs. The Russian tanks moved back, but only by five metres. So the Americans did the same. After a while, another five metres and so on until all tanks had been withdrawn. It took sixteen hours before sighs of relief could finally be breathed. Who needs a novelist when real life can be so tense? There is still a checkpoint at the same location but it’s only a mock up for tourists and the soldiers on duty are actors. But just around the corner is a small museum which has a long line of information panels telling the story of the wall. That’s well worth a visit. 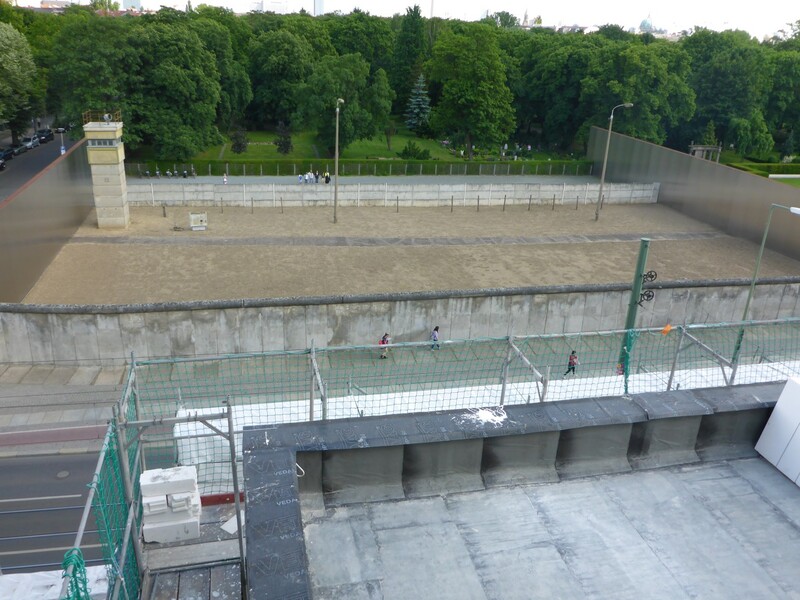 Not too far away is a 200 metre section of wall that has been preserved and also has a series of panels telling the story, not only of the wall but also of the rise of Nazism. Behind it the ground had been dug out to show the foundations of the houses that were knocked down to make way for the wall. Wall Memorial Sites. Within walking distance of my hostel is the railway bridge at Bornholmer Strasse. It’s a road bridge across the railway lines and has some interesting information panels about the escape attempts made across it, including the 1989 photos shown above. A train ride from there took me too the Berlin Wall memorial at Bernau Strasse. Arriving at Nordbahnhof station is an education it itself. Inside the main concourse is a very informative display about what happened with the Berlin transit system when the wall went up. Some of the lines that served West Berlin ran under the east. 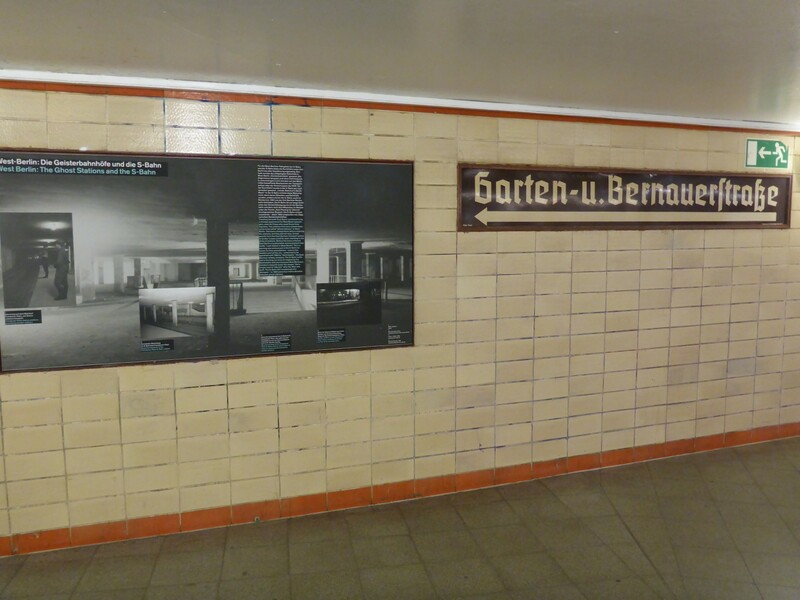 The stations on them that were in East Berlin were closed up and all surface signs of them were removed. Local residents pretty much forgot about them.Any shared platforms were walled up and guards were posted on the platforms of the closed stations to prevent East Berliners using them as an escape route. Quite a few managed to do so, some of whom were the guards. So the authorities felt they had to lock the platform guards into their observation posts and monitor them for the duration of their shift. Guarding the guards – you couldn’t make it up! Berlin Wall memorial. On the surface, on Bernau Strasse, is the main memorial area. 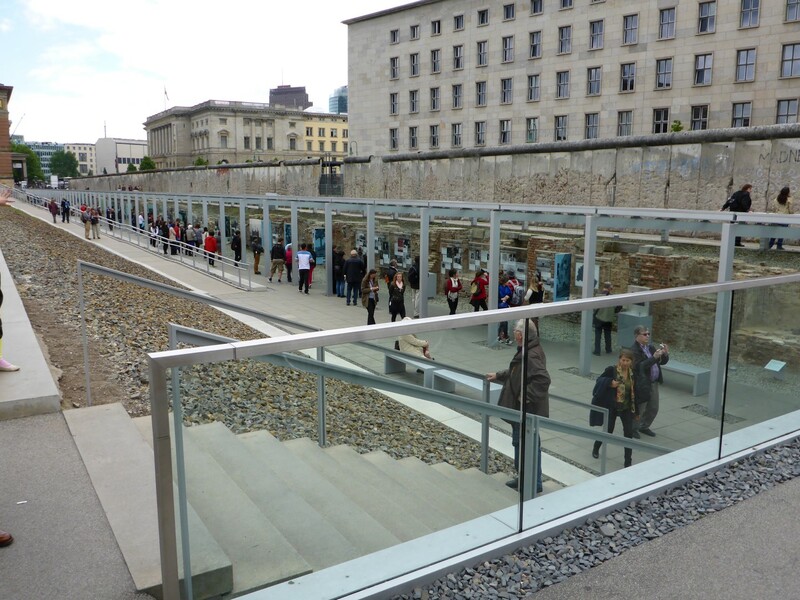 It includes sections of wall that have survived and a 1km long display of wall history made up of some archaeological displays of buildings that were torn down, some sections of wall and displays showing were the electric fences ran and such things as the walkways for the guards. There are also markers on the ground to show the lines of escape tunnels that were dug, some successfully, by escapees. 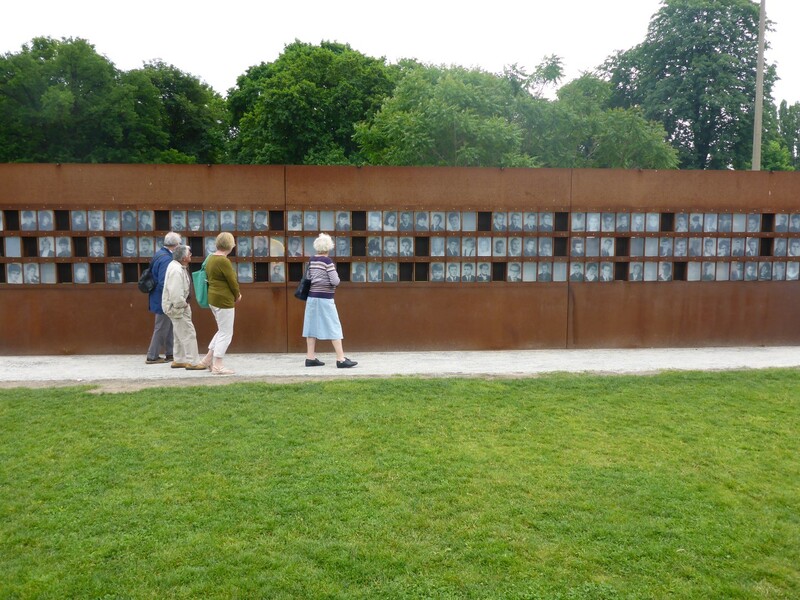 There is a display board with photos of the 136 East Germans who died while trying to escape. The border guards had shoot to kill instructions and, sadly, usually followed them. There is one remaining section, which is closed off, that has both inner and outer sections of wall still standing. They are about 40 metres apart, which is a fairly typical distance. A watchtower has been re-erected inside it so the visitor can get a good idea of what it used to look like from the observation platform opposite. One of the unique features of Bernau Strasse was its key role as an escape route when the wall first went up. It had apartment blocks along it, the front walls of which were part of the wall. People used to escape simply by climbing out of the ground floor windows. As soon as they touched the ground they were in West Berlin. Before long the authorities bricked up all ground floor access points so then people jumped from first or second floor windows. The West Berlin fire brigade would wait outside the buildings every night waiting to catch the escapees. All windows were then bricked up and eventually the blocks were pulled down. 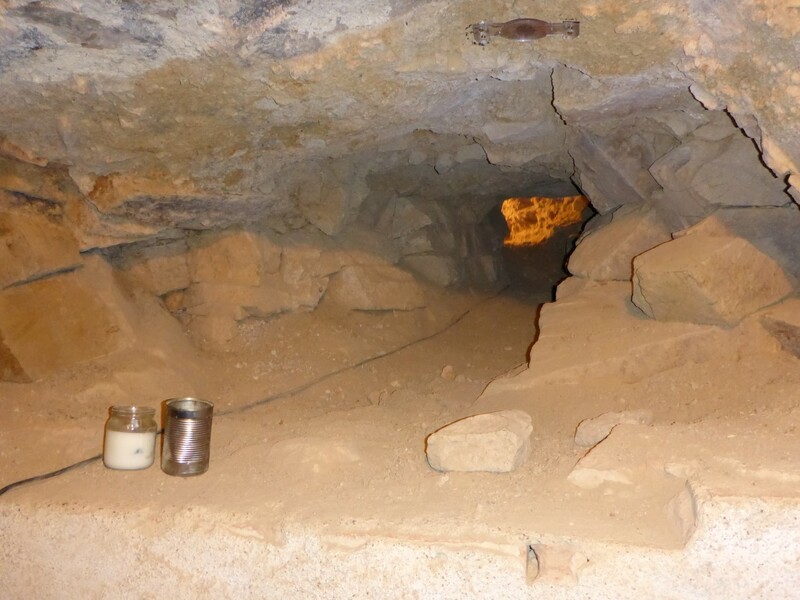 Even then, the proximity of the street to the wall encouraged escapees to focus their efforts in the area, especially regarding tunnels. Continuous Improvement. 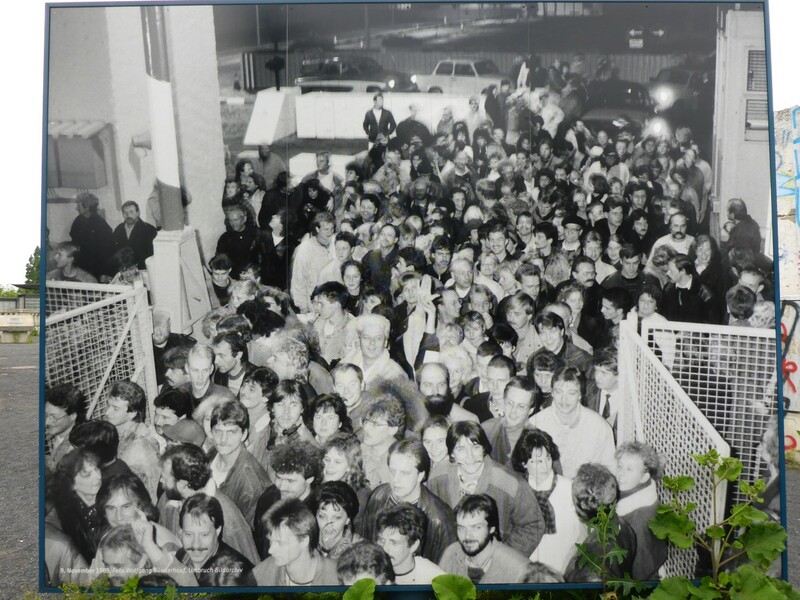 Right up to the late 1980’s the East German authorities were constantly ‘improving’ the wall by upgrading its features and making it ever more difficult to cross. One of the major steps was to build a second wall inside the first one so that there was a gap of anything up to 40 metres for escapees to cross. Between them would be electric fences, free running guard dogs, guard patrols, vehicle traps and many other devices. For all that, people still tried to escape and far too many died in the attempt. The Berlin city authorities have installed a double line of large, darker coloured cobblestones into the ground which follow the exact line of the wall. It is there to be followed as a hiking or cycling trail for the really keen. One of the display panels in Nordbahnhof Station. Follow the line of the wall. All 160kms of it. A preserved section of wall at Bernauer Strasse. Those who died at the hands of the East German border guards. Soviets hoped, and regarded Berlin as the front line in the cold war. 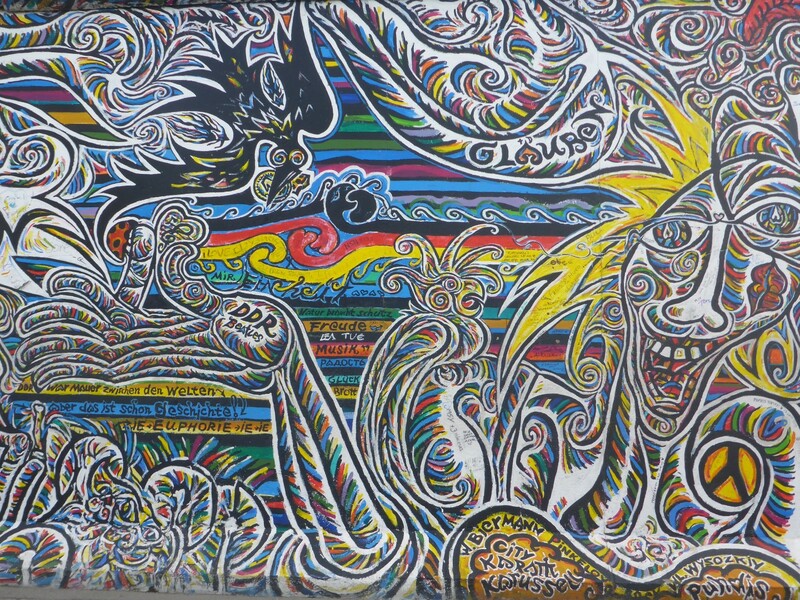 East Side Gallery. 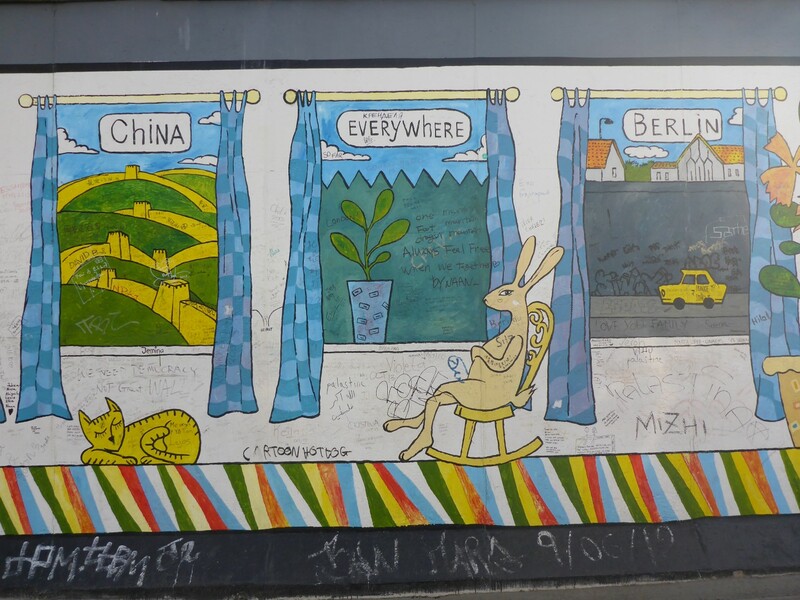 Down by the river Spree, there is a gallery formed from a 1.3km long section of the original inner wall which, in 1990, was given over to a number of artists from all over the world. There are 105 paintings spread along in based on the theme of Freedom and Peace. They were painted in an atmosphere of celebration and hope. Many of them are in poor condition although some have been refurbished. There is controversy about some of the actions that have been taken over the years but as a visitor I was unaware of any of this. All I saw was a series of incredible works of art, of great imagination and with a message that resonated with the time, the place and with me. The photos show just how amazing some of them are. It was very hard to select ‘the best’ so I’m afraid you’re getting a large selection. Feel free to choose your own. 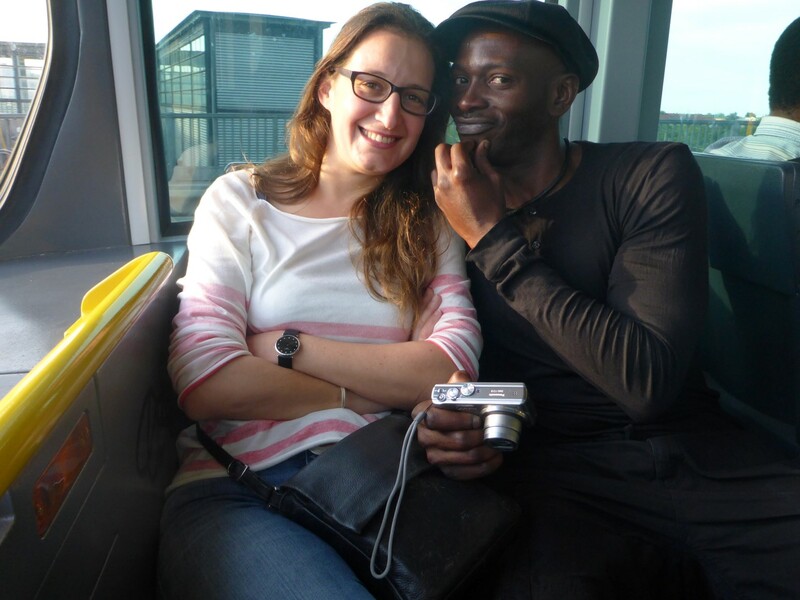 Segun and his lovely girlfriend Stefanie. Talking of packages, our wonderful, shiny, newly privatised Royal Mail decided that the best route for a package to Germany was via Ireland. It took a week to get there. What a useless bunch. At the hostel I’d met a very friendly Japanese guy called Tyoshi. He was in Berlin to go to a Peter Gabriel concert. He’s travelled all over Europe, including the UK, just to see him perform. Very keen and he reminds me of someone else I know. She will remain nameless! There was a good mix of people at the hostel and it’s always great to hear their stories. Some are very widely travelled and I’ve picked up a few contacts too. I also enjoyed Ralph’s company. We had some interesting conversations about Germany, its economy and the world in general. Never again will I ever feel the need to say ‘I really must get out more’. Before I leave, the answer to the blue pipe mystery. There were some of them in Berlin too and I learned that they’re used to pump water out of excavation sites where the water table is high enough to cause problems. 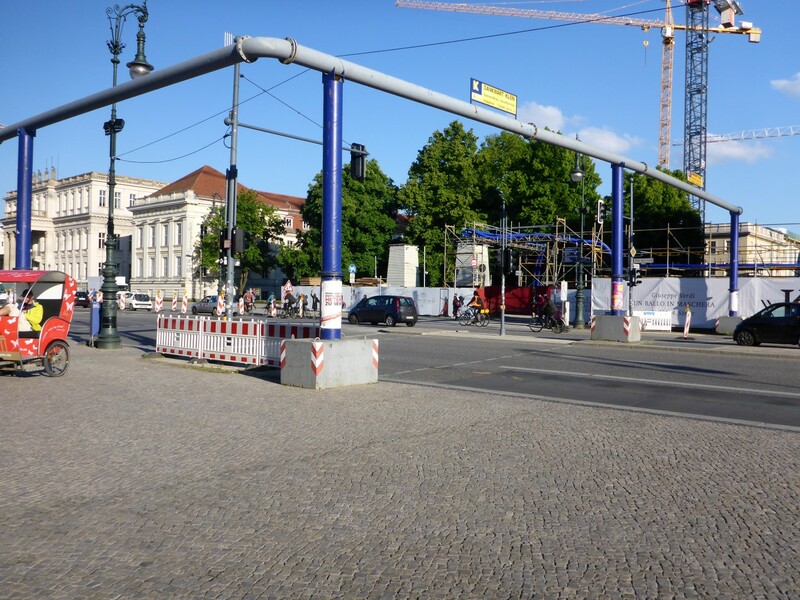 Berlin has blue pipes too. Making gold from old. 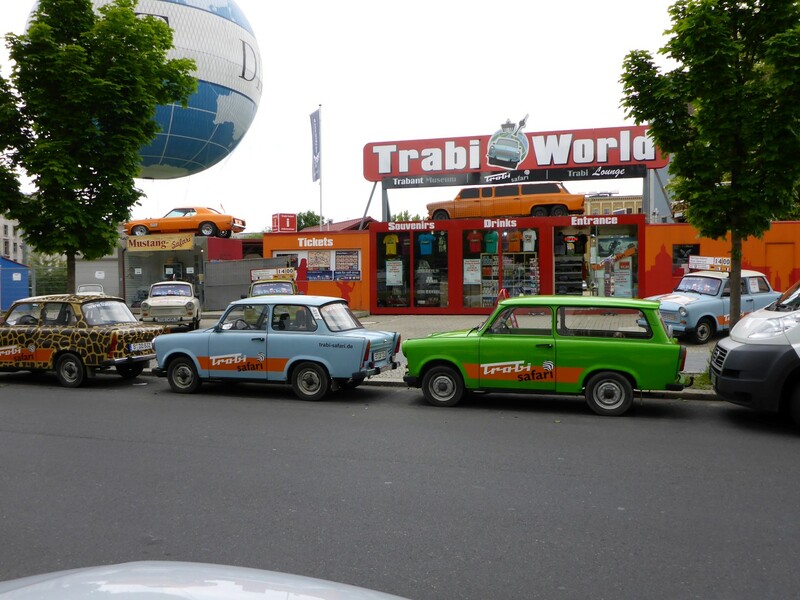 One of the funkier sights in Berlin. So I leave Berlin this time with a feeling of joy for its people, who seem to have found peace and happiness in their reunification. They look to be enjoying life, are tolerant of visitors and the city itself looks wonderful. I enjoyed my time there enormously and would love to go back. If you like cities, you’ll love Berlin. If you don’t like cities, you’ll still love Berlin. Book a flight or a ferry and go see for yourselves. What next for me? The Road to Freedom beckons. Thanks for another great post. I spent a few years in Germany in the 80s, but never made it to Berlin and wasn’t allowed to go to the East. Once again you have whetted my appetite to visit some of these wonderful places. Looking forward to you next blog. Enjoy the warm weather while it lasts. Thanks David. Berlin is a great city and you should get out there. 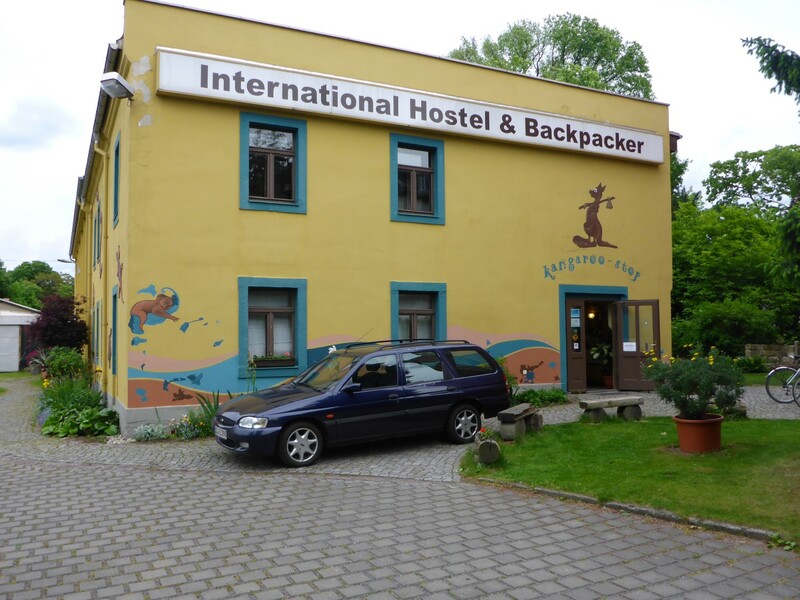 Inn Berlin Hostel will also do private rooms. Blimey that is long! Regarding the group of canadians, I have come across a few in my time and they have all been self centered and obnoxious. I can’t obviously speak for the nation but the ones I have spoken too are all up their own bottoms. It’s interesting what you say about the pipes Jim. It makes more sense than what I was told. Hi Liz. Well, I’m doing what I can although I’ve forgotten a lot of it. I was staying with a very nice family and she speaks good English. But I’ve been trying. I’ll be in Kazakhstan tomorrow and I have a feeling the Russian will be very useful there. Hi Dave. Thanks for your kind comments and I’m glad you’re enjoying the blog. My comments weren’t about that group being Canadian, they were about the nature of groups and how they miss out on mixing with others sometimes, so I hope nobody’s taken any offence. you are amazing stud muffin geoff the elder. i also feel exceptional touched i got a honorary / very distinguised mention in your blog. keep riding safe and i hope you come back again through berlin. Thanks for the compliment Segun. I’ve never been called a stud muffin before and I had to look it up. But I think I know which one of us the term really applies to. Best of luck with your business Segun, it was fantastic to see you again and look after the lovely Steffi.